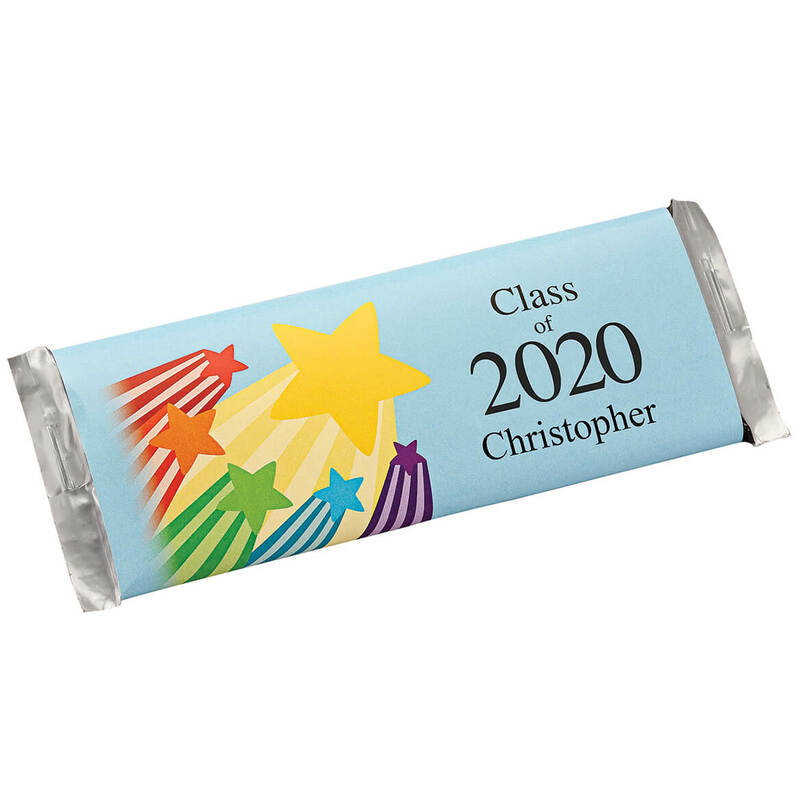 Now that the schoolwork is over, encourage a new grad to shoot for the stars with these personalized candy bar wrappers. Colorful shooting stars light up the sky-blue background, leaving just enough room for a heartfelt message on both sides. Specify front message; limit 1 line, 14 characters. “Class of” is not standard. Specify back message; limit 2 lines, 40 letters/spaces. Set of 24 chocolate wrappers measure 5 1/4″ x 6″ each. Candy bars not included. 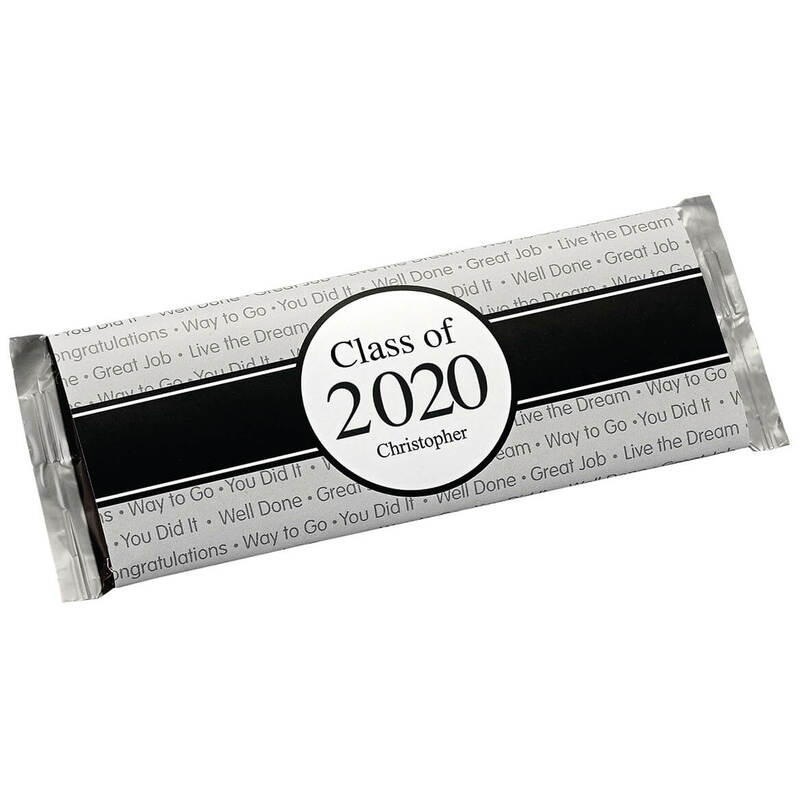 Celebrate a special grad’s accomplishment with these personalized candy bar wrappers. Decked in rich beige with a graduation cap and diploma in proud display, the glossy wrappers feature room for a heartfelt message on both sides. Specify front message; limit 1 line, 14 characters. “Class of” is not standard. Specify back message; limit 2 lines, 40 letters/spaces. Set of 24 chocolate wrappers measure 5 1/4″ x 6″ each. Candy bars not included. 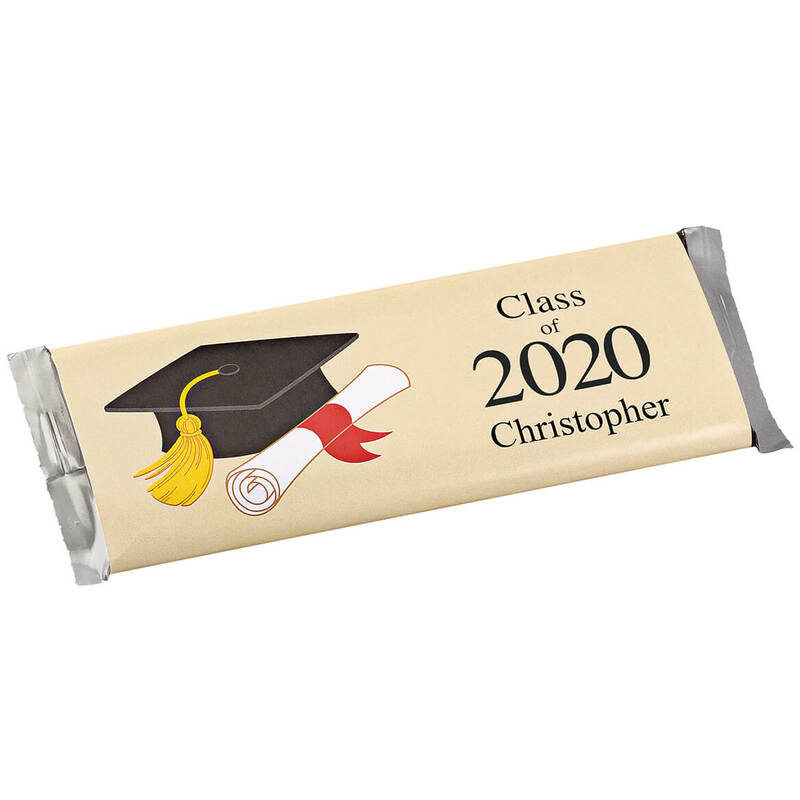 Celebrate a special grad’s accomplishment with these personalized candy bar wrappers. Decked with encouraging words and congratulations in the background, the glossy wrappers feature room for a heartfelt message on both sides. Specify front message; limit 1 line, 14 characters. “Class of” is not standard. Specify back message; limit 2 lines, 40 letters/spaces. Set of 24 chocolate wrappers measure 5 1/4″ x 6″ each. Candy bars not included.